Rajendra G. Wagh Ex.Professor, Dept of Rasa Shastra and Bhaishajya Kalpana, Govt. Ayurved College, Nagpur, Maharastra, INDIA. In the course of evolution of human life, man has struggled a lot to obtain the best of living standards. Among all necessities, health care is given the best attention because, only healthy individual can enjoy the benefits of beauties of the nature. Positive health doesn’t mean only physical but physiological, mental, social and spiritual wellbeing also. If the principles of Ayurveda are studied in modern scientific way, both in respect of its approach to disease and therapy, especially in relation to Madhumeha. Diabetes results when the body makes too little insulin or does not use insulin properly, allowing sugar levels to build up in the blood stream. The free radicals are one of the important etiological factors for the development of diabetes and its complications. Antioxidants capable of protecting against the damage induced by free radicals and it also have a role in reducing the effects of diabetes. There are many herbal medicinal plants like Babul, Bilva, Davana, Neem, Jambu etc. with proven antidiabetic and related beneficial effects. Bilvapatra is effective in the treatment for diabetes by reducing blood glucose level. So in present study Bilvapatra Ghana is used in the management of Madhumeha. BUDHWAT, Prashant P.; WAGH, Rajendra G.; PATIL, Pravin A.. A CLINICAL STUDY ON THE EFFECT OF BILVAPATRA GHANA IN THE MANAGEMENT OF MADHUMEHA WITH RESPECT TO TYPE II DIABETES MELLITUS. 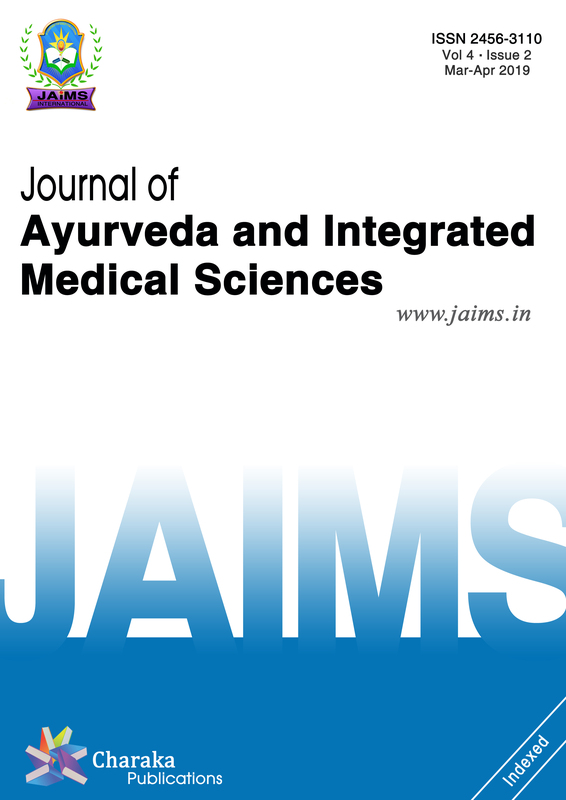 Journal of Ayurveda and Integrated Medical Sciences (ISSN 2456-3110), http://www.jaims.in/index.php/jaims/pages/view/Citation, v. 3, n. 5, p. 27 - 29, oct. 2018. ISSN 2456-3110. Available at: <https://jaims.in/index.php/jaims/article/view/683>. Date accessed: 25 apr. 2019. doi: https://doi.org/10.21760/jaims.v3i5.13815.